Just a reminder that the Creative Hawke's Bay Invitational Exhibition is finishing this Sunday at the Hastings City Art Gallery. Below is a detail on one of the works I have in the exhibition, Rectángulo De Tiempos Del Final (2009, Oil on wood and a leaf; scrimshaw and nails, 325mm x 770mm x 90mm). The half head/half skull is a classic I've been using a lot recently, a pertinent symbol of mortality, copied from a very small German bone carving I saw at the Met in NYC. Since then, I've found many images of the half and half kind, some of the best are 19th century Italian wax sculptures, used as medical guide, I believe. 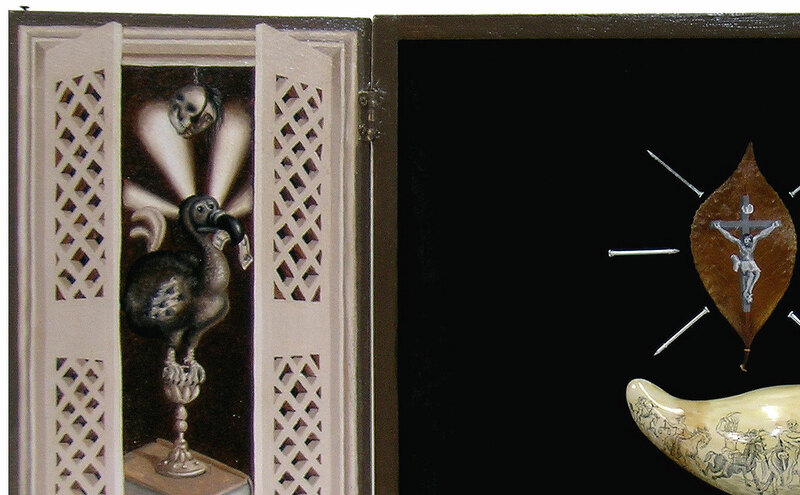 The dodo is also a great symbol for mortality, first used at artschool in a set of drawings in 1997. I started reusing the dodo in my paintings in 2003. He's holding a bank note in his beak and is standing on Charlemagne's chalice. I am attempting (in vane, I might add at the moment) to photograph the majority of pages out of my 'resource books'. As we're leaving the bulk of our book collection in storage, I think I'll feel a bit lost without all those beautiful art tomes to leaf through. Although the majority of the books I'm photographing seem to be about Spanish Baroque painting and Mexican folk art, one of my most coveted books is 'Fra Angelico: The San Marco Frescoes' by Paolo Morachiello. I had to buy a hardback copy of this edition after visiting the cloisters at San Marco Chapel in Florence. A truely magnificent place that taught me alot about composition, pictorial space; colour and line. 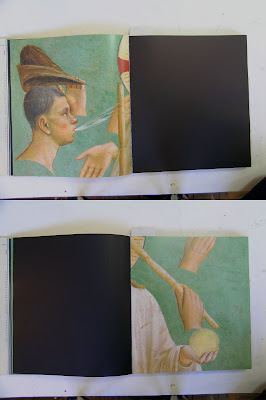 Below is a couple of double page spreads of The Mocking of Christ by Fra Angelico. It has to be my favourite fresco ever - the disembodied hands and head, whipping and spitting at Christ is truely abstract in its concept. Throughout the book, are full scale detail reproductions of indivdual frescoes, making it the prefect resource book. Friends of ours are selling their villa in Wellington and we checked out the photos of their abode. Like my penchant for looking through New Zealand House and Garden to see what art is hanging on the walls of the featured houses, I got a buzz seeing a few of my works on the walls on the website house-listing. Along with my work, there is a James Robinson woodcut, a Saskia Leek vinyl painting, Paul Maseyk bottles, Leigh Mitchell-Anyon photographs and a Simon Kaan print.